During the holidays, we work to assist the whole person through gifts that serve the body, mind and soul. Every year, parents must choose between giving their children gifts or paying bills. Individuals facing poverty often spend the holidays without the warmth of a shared meal or even a support system. The holidays bring added financial and emotional stress to families and individuals living in poverty. From gifts for children in need to special meals for those who would otherwise go without fellowship on the holidays and meeting other basic needs - we aim to bring joy back into the season. 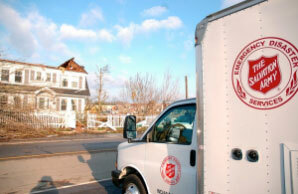 The Salvation Army's mission shines brightest at Christmas. We celebrate the birth of Christ by spreading His hope, love and joy to those who are hurting during the holidays and throughout the year. In fact, our services are a direct answer to God's calling to care for the poor, hungry, sick, and displaced. In some cities, you can organize a group to adopt a family in need and help them have a better Christmas celebration. Check with your local Salvation Army to see if they offer this program. Whatever it's called in your town, it's meant to provide toys to kids who otherwise might not find anything under the tree on Christmas morning. The Salvation Army helps bring people together for the holidays by providing everything needed for a traditional Thanksgiving or Christmas dinner at home and hot meals at our centers where hundreds gather. Giving everyone, young and old, a place to celebrate with others is a simple thing that goes a long way toward helping people during the holidays. Many Salvation Army locations conduct community coat drives in the fall to provide coats to those in need all winter long. You can make Christmas merry.